Olympics: GOLD for Jamaica Men 400m Relay Team. Yet Another World Record! In yet another mind-boggling display of speed, Usain Bolt set another world record and won another Olympic gold medal, and this time got to share the glory with his Jamaican teammates. Both Bolt and Asafa Powell blew away the field over the last two legs of the 400-meter relay leading Jamaica around the track in 37.10 seconds to break the 16-year-old world record by 0.3 seconds. 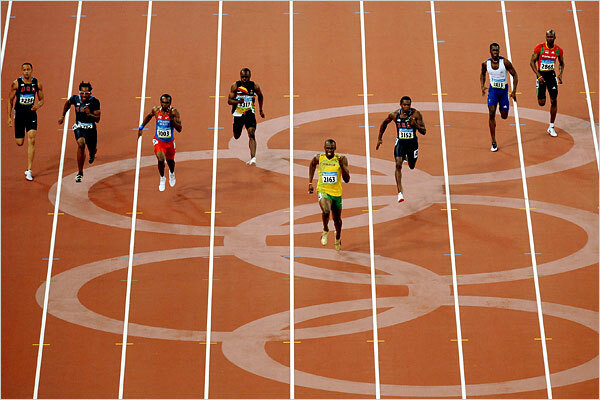 Bolt is now 3-for-3 in these Olympic sprints — as in three gold medals and three world records. The bonus is that he got to bring Powell along for the ride. Powell held the world record in the 100-meter dash for about three years before Bolt broke it in May, but he is also well known for his history of poor performances in the biggest meets. In this one, Powell got to do the honors, running the anchor leg, taking a clean handoff from Bolt and crossing the line almost a full second ahead of Trinidad and Tobago‘s Richard Thompson to secure his first Olympic medal. The Jamaican quartet, which also included Nesta Carter and Michael Frater, eclipsed the old 400 relay mark of 37.40 set by the United States at the Barcelona Olympics in the 1992 and tied by the U.S. at the world championships a year later. Bolt added that to the records he set in winning the 100 meters (9.69) and 200 meters (19.30) in Beijing. The Jamaicans were nearly a full second faster than relay silver medalists Trinidad and Tobago, which finished in 38.06. Japan took the bronze in 38.15. The Jamaica women’s relay team failed to hand off the baton in the third leg of the relay and did not complete the race. We are VERY PROUD of the women team!!! Jamaica is 4 out of 5 in their sprint events. Team Jamaica now has a total of 10 medals: 6 gold, 3 silver and 1 bronze. Olympics: Usain Bolt of Jamaica Sets NEW 200 Meter World Record. Clocks 19.30 Seconds – Makes History! On the eve of his birthday, Jamaica’s Usain Bolt made history. He won the GOLD for the 200 meter by four body lengths on the world’s biggest stage at the Olympics in Beijing, China. 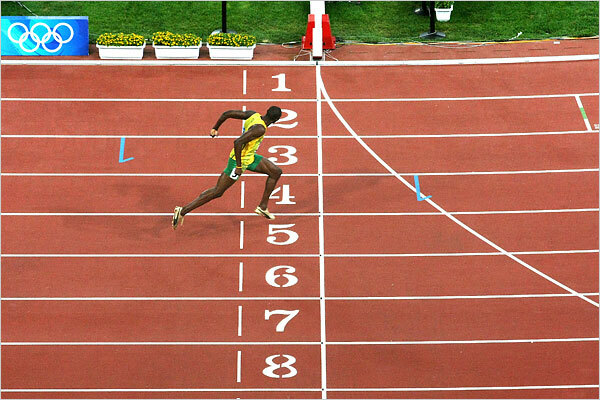 He smashed Michael Johnson’s 12 year record of 19.32 seconds – Bolt won in 19.30 setting another world record!!! 21 year old Bolt became the first man ever to break the world record in both the 100 and 200 at the same Olympics and the first since Carl Lewis in 1984 to win the sprint double. 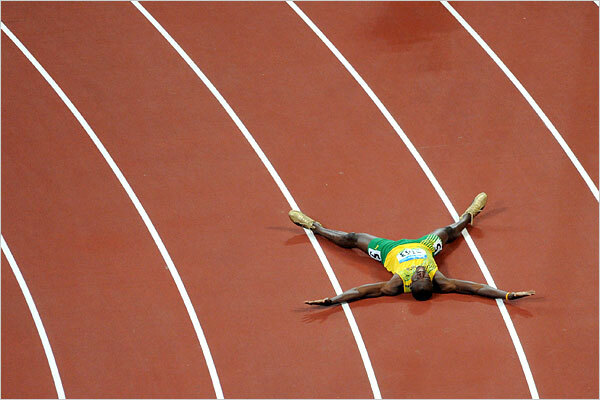 Bolt had already won the race halfway through, but unlike his record-setting performance in the 100 four nights before, there was no animated celebrating until he crossed the line. He went hard all the way, looking at the clock down the stretch, leaning at the line, knowing that Michael Johnson’s revered mark was within reach. Bolt had been accused of jogging through the line in his heats but the Jamaican said he would run flat out in the final and he delivered on that promise with fascination! He blasted out of the blocks and was already well clear of the field going into the bend at the Bird’s Nest stadium. The Olympic 100m champion accelerated away down the straight, gritting his teeth as he chased down gold and the record that Johnson set 12 years ago in Atlanta. When he saw the number come up — a number that never has before been displayed in a human race — he raised his arms, then fell flat to his back, arms and legs outstretched, and basked in the roar of the Bird’s Nest crowd. Bolt now has three world records – this one, the 100 meter from Saturday and the one from Randall Island, New York in May when he broke the 100 record the first time. A version of “Happy Birthday” played over the public-address system as he took off his gold shoes and wrapped the Jamaican flag around his shoulders like a scarf. The race for the other medals was a little dramatic. Churandy MARTINA of Netherlands Antilles finished second behind Bolt and American Wallace Spearmon came in third.